Evelyn Cardiff is a distance member of the Sudbury Writers Guild. She lives in Gore Bay, on Manitoulin Island, and writes a mix of fiction and non-fiction. 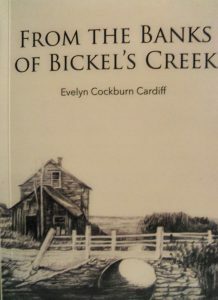 She published her first collection late 2017 titled From the Banks of Bickel’s Creek. For several years, her humorous memoir pieces were published in High Grader Magazine. Ev is also a member of the Manitoulin Writers’ Circle.